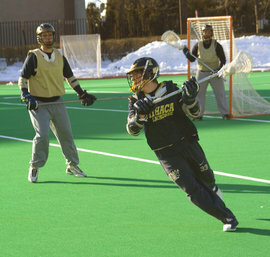 The men’s lacrosse program at Ithaca has a record of 300 and 167 in the 37 years that lacrosse has been a varsity sport. In 1946, Joe Corcoran brought the sport to Ithaca through an intramural program. Three years later, lacrosse became a club sport until 1951. After a 14-year hiatus the sport resumed on campus in 1965, and two years later the men’s lacrosse team was recognized as a varsity sport. This year, the lacrosse team is led by head coach Jeff Long and assistant coaches Tim Pendergast, Andy Schreck ’01, and John Wallace. Throughout its time as a varsity sport, a total of 11 Ithaca athletes and one coach have been inducted into the Ithaca College Athletic Hall of Fame. Alec Siefert gets taped by grad student Jen Plouffe in the Hill Center training room before practice. Physical therapists and athletic trainers have played important roles in Alec's life. Find out about Ithaca's degree programs in both fields. A determined athlete overcomes injury to play lacrosse for IC. Alec Siefert ’09 is a star player for Ithaca’s varsity lacrosse team. He balances the typical schedule of a college athlete, keeping up with the rigors of his business administration major while going to practice every day. To get where he is today, however, he’s had to overcome an extra challenge and some incredible odds: when Siefert was a senior in high school, doctors told him he’d be lucky to ever walk again. While playing ice hockey that year, Siefert was badly injured when a skate severed his peroneal nerve, the nerve in the leg that controls movement in the foot. He was diagnosed with drop foot, a neuromuscular disorder that affects the ability to raise the foot at the ankle, which makes walking -- much less running -- a challenge. Repairing the injury required surgery and intensive rehabilitation. “The doctor who did the surgery discouraged me from playing sports,” Seifert recalls. In his hometown of Duxbury, Massachusetts, lacrosse is a big tradition. At the time of the injury, Siefert was captain of the lacrosse team and he had his sights set on leading his teammates to a state championship. He was also being recruited to play college lacrosse. Learning that his injury could bench him permanently was sobering, but Siefert didn’t give up. Undeterred, Siefert set himself a new goal of getting back in the game. With intense physical therapy, he was not only able to play sports again, but he went on to achieve his goal of winning the state championship that year. It wasn’t easy, however, and things didn’t get any easier once he began playing lacrosse for Ithaca. “I’ve been dealing with this injury for two and a half years, and it has been difficult as a college athlete,” Siefert says. After the initial surgery there was little he and his doctors could do except wait to see if the nerve would regenerate on its own. Owing to the drop foot, Siefert repeatedly sprained his ankle during his freshman year, and just last year he fractured the kneecap on his opposite leg, most likely, he thinks, from overcompensating with his good leg. This past summer, Siefert underwent a tendon transfer surgery to rectify the problem. He again underwent intense physical therapy and wore an ankle-foot orthosis brace to stabilize his ankle and foot. Now that his injury has finally been corrected, he’s looking forward to another season with the men’s lacrosse team. Awesome story, sounds like it came from a movie. Siefert's dedication and love for what he does should be admired. And yes, I belive it's worth it. i too have been injured in my respective sport and it is not an easy thing to go through. you lose fitness, game, and practice time.fortunately Alec and I have been able to overcome our injuries. luckily, they were not career ending. athletic trainers are very knowledgeable people and can help athletes with their injury not only physically but mentally and emotionally.